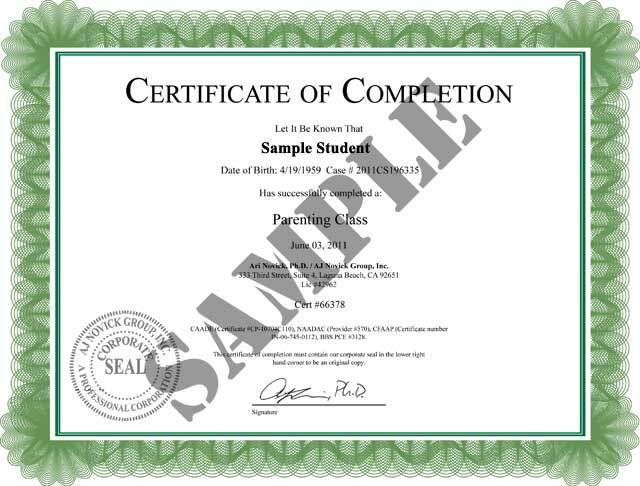 What is an Parenting Class Certificate of Completion? Click the link below to see a sample copy of our parenting class or co-parenting class certificate of completion. Our certificate of completion is a commonly used form that is generated after a customer completes our online program. The certificate is used to present to a court, attorney, social services or other legal entity that may have requested this program to be taken. Others may use the certificate for personal growth and hold on to it as a token of personal achievement. If you are using this certificate for a legal requirement, it will include your name, date of birth, case number, address, phone and certificate verification number.